FSU Army ROTC students trained with each other in the months leading up to the Ranger Challenge at Camp Blanding, Florida. One team earned top honors at the regional competition, which attracted more than 400 students from nearly 40 universities. 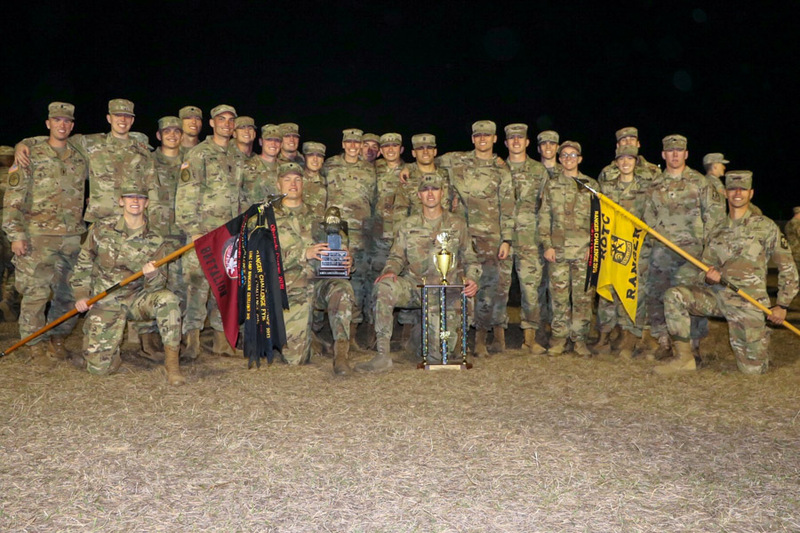 A team of talented Florida State University Army ROTC members are celebrating a big win over the weekend that will send them to the finals of the 2019 Brigade Ranger Challenge. Florida State fielded two 11-person Ranger Challenge teams, all students from the Department of Military Science. They competed at Camp Blanding, southeast of Jacksonville, against 39 squads and more than 400 cadets from universities in Alabama, Louisiana, Mississippi, Florida, Georgia and Puerto Rico. The winning FSU team will now compete at the Sandhurst Military Skills Competition at West Point, New York, in April. The competition took place over 72 hours and tested the cadets’ physical and mental toughness. It was designed to teach leadership skills and offer lessons on how to use teamwork most effectively. The Ranger Challenge tested teams on fitness, rifle marksmanship, land navigation, tactical combat casualty care and carrying 35-pound packs over 18 miles. The members of FSU’s winning Ranger Challenge team were Hayden Hurst, Zach Johnson, Melissa Kratzke, Jordan Rapport, Eric Menin, Colin Gradolf, Nick Fair, Caleb Butler, Ayers Hassig, Lexi McClellan and Nicolas Saris. Florida State’s Department of Military Science trains ROTC students for a commission in the United States Army, Army National Guard or United States Army Reserve. The program includes military science courses and field training with a mission to develop the nation’s Army leaders of the future.